Jasper Sone is a 2nd generation Korean-American from Houston, Texas. 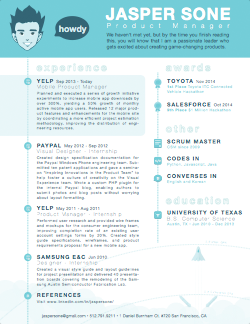 Currently he resides in San Francisco pursuing his love for product management, mobile development, and design. At this time, Jasper is actively pursuing product management opportunities in the Bay Area. If you would like to contact him regarding such opportunities, please leave him a message below or if you’re just looking for a more information about him, grab a copy of his resume to the right. Click here to download my resume in pdf format. © 2011 Jasper Sone. All rights reserved.